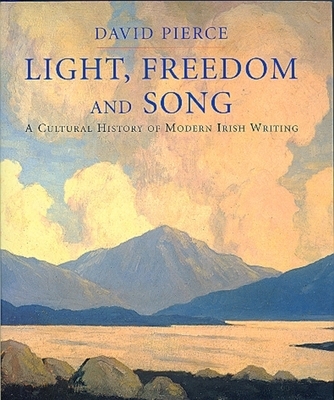 FOLLOWING ON from a number of acclaimed critical works on major Irish writers including Joyce and Yeats, David Pierce in Light, Freedom and Song, embarks on a re-reading of the last two centuries of Irish history based on what he terms the 'encounter' between the two civilisations Gaelic and Saxon. Pierce prefers the term 'culture' to 'civilisation in this context however because it allows him to concentrate better on the outcome, or legacy, of that encounter, i.e. the state of Irish society today as reflected in, or exemplified by, modern Irish writing. His themes throughout are the linked ones of loss and struggle and his recurring images or symbols those two ancient irreconcilables the Harp and the Crown. The task Pierce has set himself is the retelling of Ireland's complex and torturous history through the eyes of its writers; how Irish poets and novelists attempted in their work to come to terms with events like the Great Famine and the decline of the language and were themselves moulded and shaped by the experience. The 'Light' of Pierce's title is then the literary or artistic counterpart of the nightmare of history, the dark which so very nearly annihilated for ever the Irish nation. If however the story itself is an almost unremittingly gloomy one there is compensation and relief in the manner in which David Pierce relates it because he is marked out here as a very fine storyteller. The book is in fact a companion to Irish creative writing over the last two hundred years, a fascinating blend of commentary and critical analysis and speckled with gems of information throughout. The literary giants of the twentieth century are all here, Yeats, Joyce, Beckett, Heaney et al, along with a host of others. There is much thoughtful analysis of the work of people like Liam O'Flaherty and Benedict Kiely and the Cork duo O'Connor and O'Faolain and penetrating surveys of the work of Brian Friel and John McGahern. Interest should also be reawakened in some interesting but neglected Irish writers, like Derry born Kathleen Coyle (1883-1952) whose realist novels Liv and A Flock of Birds surely deserve to be brought back into print. The after-effects of the 'encounter' are naturally central to such a work, and Pierce skilfully tracks the changes and developments in the Irish cultural landscape brought about by colonialism. 'Ireland in the 1930's, perhaps the most illuminating chapter in the book, is a wonderfully concentrated view of the frenetic political and literary activity of that first full post-colonial decade and highlights well those comparisons, contrasts, complexities and downright contradictions that go to make up the Ireland we have inherited. Recent developments in the north of Ireland are addressed in 'Ireland in the 1980's', with emphasis on the hunger strikes, and the reminder if one is needed, that the 'encounter' is still very much a continuing event. Colonialism and cricket have long and close associations though not a great deal has been written about the Irish experience of this most British of games. Because of cricket's close identification with the coloniser, or possibly for reasons more subtle, the game never quite caught on in Ireland. However in 'Beyond a Boundary' David Pierce makes the telling point that in the hands of a writer as incisive as James Joyce cricket could become a subtle but telling means of expression and even a badge of national identity. In A Portrait of the Artist as a Young Man for example, which Pierce describes as a 'colonial text', the sights and sounds of a game of cricket impress the young Stephen, Joyce's protagonist, as vivid symbols of hope and change, which in turn predict or anticipate the ending of colonial rule in Ireland. David Pierce is fortunate too in his publisher. This volume is beautifully produced and illustrated throughout with many black and white and colour reproductions of art and poster work, delightful period postcards, book illustrations and some superb photography by people like Evelyn Hofer and John Minihan. The very copious and informative chapter notes are arranged separately from the text for ease of access and the bibliography represents a whole library of essential reading for those with an interest in modern Irish literature. David Pierce is an example of that rare phenomenon, an entertaining and readable literary critic. Light, Freedom and Song is a valuable book and a refreshing re-examination of the variety and complexity of Irish history and literature. This document was last modified by David Granville on 2009-04-29 18:33:28.